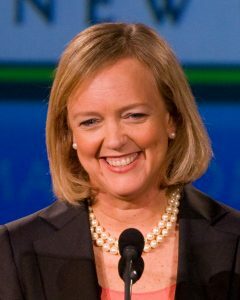 The traditional media is spilling a lot of ink about Republican Meg Whitman making a trip to Colorado today to stump for Hillary Clinton. Many will recall that Whitman was the finance chair for Mitt Romney’s failed 2012 presidential campaign, and was often seen on the road as a major surrogate for the candidate. What hasn’t been so transparent is the rest of the former Ebay and HP CEO’s political activities, and it does not paint a picture of a faithful Republican. Many of these issues came to light when Whitman was the 2010 Republican candidate for governor of California. Whitman’s charitable foundation donated $100,000 to the Environmental Defense Fund; this accounted for 80% of the charitable fund’s total contributions in the year of the donation. Whitman is a “huge fan” of Democratic activist Van Jones, who is also “very articulate” according to Whitman, who met Jones on a cruise to the Arctic where they learned about global warming. Whitman made numerous other $1000+ political contributions to prominent Democrats such as John Kerry, Maria Cantwell, and Gary Ackerman, among others. Billionaire Whitman is not exactly a model Republican. It should not surprise us that someone with her track record would fall in line behind Hillary Clinton, given her record of robust support for Democrat politicos. It should be more surprising that she supported a Republican at all.